An MP whose house was burgled while his family and visitors slept has called for homeowners to be allowed to arm themselves with Taser stun guns. 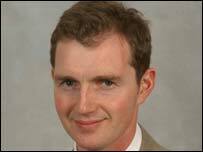 Thieves broke into the home of Conservative Monmouth MP David Davies, stealing passports and £300 in cash. 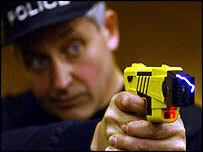 He said he felt violated by the crime and wanted householders to be allowed to use police electronic stun guns. Victim Support said while people should be able to use reasonable force, they should call 999. Mr Davies's Fiat Punto was used as a getaway car by the thieves who broke in through a downstairs window at his house in his constituency early on Sunday. The burglar alarm was turned off because the MP's sister-in-law and her boyfriend, who were visiting, were sleeping downstairs. The thieves got away without disturbing the family but Mr Davies said he believed they armed themselves with a knife they found in the kitchen. "It's probably lucky that I didn't wake up," Mr Davies told BBC Radio Wales. "It's lucky they didn't come upstairs. They took what they wanted and went. Mr Davies said constraints on people trying to defend their homes were "crazy". "What am I meant to do? I'm a fit, healthy 30-year-old. I probably wouldn't have got the better of them. "If I had I would have probably been in trouble with the law myself." Tasers, which are used by police forces in the UK, work by temporarily disabling whoever they are fired at with an electric shock delivered by two barbed darts trailing wires. Mr Davies added: "Shouldn't I, at the very least, be able to stand at the top of my stairs with a Taser - which isn't going to kill somebody - and use that as a means of self defence?" The politician said training people to use the Taser guns would prevent cases such as that of Norfolk farmer Tony Martin, who shot and killed a 16-year-old intruder. "I know exactly how he felt. You can see why people would not want to take any chances," he said. Although voicing support for Mr Davies, Victim Support Wales advised against home owners being armed with the electronic stun guns. John Trew, Victim Support's national officer for Wales, said; "I don't think there is a problem with people using reasonable force to defend themselves." But he said if there were burgling your house, people should "ring the police, don't try to take them on." In a statement, Gwent Police said it did not support householders arming themselves with Tasers "or any other type of weapon in order to protect their property".